The media is full of comments about global interest rates rising, but after almost two years with the Australian official interest rate at 1.50% is a rise really imminent? Probably not if you study the RBA minutes. Commentators have focused on key comments indicating that the next move is likely to be up, but will not be seen for some time. 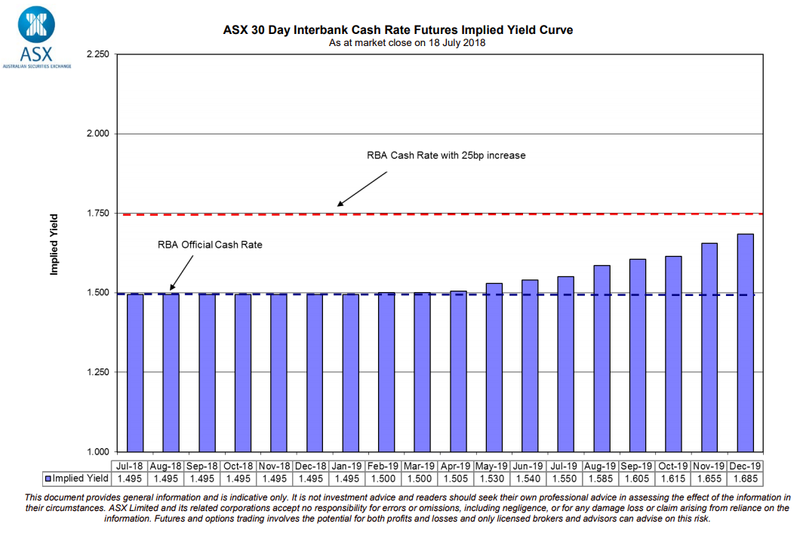 In the minutes of the RBA’s July board meeting they reintroduced the comment “the next move in the cash rate would more likely be an increase than a decrease”. But, the RBA also noted “since progress towards a lower unemployment and inflation rate closer to the mid-point of the target range was likely to be gradual”. This implies any movement in rates would be some time away. The on-hold view is supported by the comment “there was no strong case for a near-term adjustment in monetary policy”. The market is still not pricing a full 25bp rate increase in 2019, and this seems fair. We remain confident there will be no RBA change during the first 3 quarters of 2019.